Reliability is at the forefront of utilities’ concerns, and rightly so. People expect power to flow 24/7 and any interruption is disruptive for customers and costly for utilities in terms of regulatory penalties linked to downtime and outage frequency. Grids in Europe and other mature economies in Asia, such as Japan, are generally seen as very reliable but both North American grids and emerging economy grids are considerably less reliable than they should be. Power outages and interruptions in the U.S. still cost Americans at least $150 billion each year while downtime harms a utility’s reputation. Blackouts inconvenience customers who depend more and more on reliable energy with the proliferation of electric devices in our modern lives. They disrupt services and operations, which is especially problematic for critical sites like hospitals, data centers, and military installations. They can even cripple economies: The World Bank estimates that blackouts alone cut the gross domestic products of sub-Saharan countries by 2.1 percent. So how can utilities improve reliability in the future? North America and some “new economy” countries could rely heavily on microgrids for resilience. Whereas some Asian countries will invest in modern and robust networks, and Europe will reinforce infrastructures based on technology upgrades. Many of these developments will depend on whether downtime is caused by internal or external factors. Internal factors, such as equipment maintenance issues, human error, technology malfunctions, and aging infrastructure, are often responsible for downtime incidents. These are the low-hanging fruit of downtime reduction because they are areas that utilities directly control and can strategically fix. Transform maintenance practices from reactive to predictive and condition-based maintenance. By doing so, you can better detect the onset of asset degradation by continuously monitoring asset performance using data from embedded sensors and prediction engines. This provides warning about equipment problems and failures. Human error, which is responsible for most inefficiencies and interruptions, can be tackled on two fronts — by better preparing employees and implementing technology. When operating, employees can lack the training, experience, and knowledge, and so they are more likely to make mistakes. Virtual reality is an example of technology that can help operators gain this experience in simulated yet realistic environments. Creating and implementing strategies that provide engineers with the tools they need to do their jobs successfully and putting detailed procedures in place enables fast troubleshooting and minimal impact to business. For example, augmented reality can guide them step by step in operations on equipment they are not accustomed to using. System complexity also drives human error. Because data collection has skyrocketed in recent years, due in part to the rise of devices like smart meters, grid or power plant operators can become overwhelmed with information. New technology and predictive analytics can provide clarity. Situational awareness — having the right information at the right time so operators can make the right decisions — is being improved through visual situation awareness systems that enable faster, better, and more accurate decision making by presenting data in a manner that’s easier to process and more actionable. Aging infrastructure can result in power disruptions and make utilities vulnerable to security attacks. 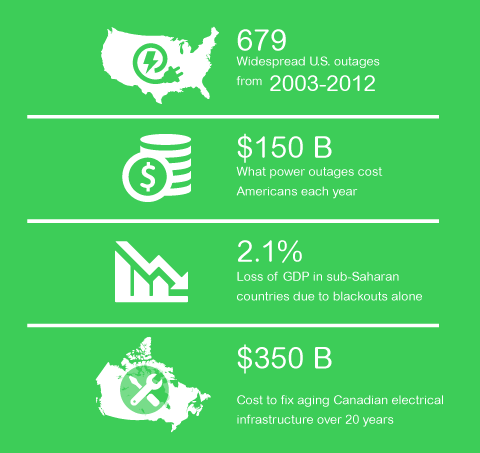 Although modernization can come with a hefty price tag — it will take an estimated $350 billion in capital investments over the next 20 years to tackle Canada’s aging infrastructure issues, for example — it is an urgent concern that really can’t wait. External factors are more difficult to control, but there are ways to prepare and improve how to respond. They’re caused by a number of factors, such as bad weather, accidents (like when a car hits a utility pole or a construction project damages an underground line), or malicious attacks (either physical or grid cybersecurity). Severe weather is the leading cause of power outages in the United States. It was responsible for an estimated 679 widespread power outages between 2003 and 2012. Advanced technology and storm-related predictive analysis allows more accurate forecasts that enable utilities to better predict areas likely to sustain damage from an approaching storm. This data allows utilities to position field crews in advance so they can easily be deployed to affected locations. Technology is evolving to keep up with risks. Soon, security risk assessments will be standard in project implementation and planning, and equipment security is getting better every day, thanks to new technology. Government regulations continue to play an active role in setting security standards which must be met. Technology can also improve the response, for example, by making grids able to “self-heal” by automatically reconfiguring after damage. As we look to the future, it’s clear that utilities will be expected to further improve their reliability. Technology innovations, analytics, and advanced maintenance practices can all help. 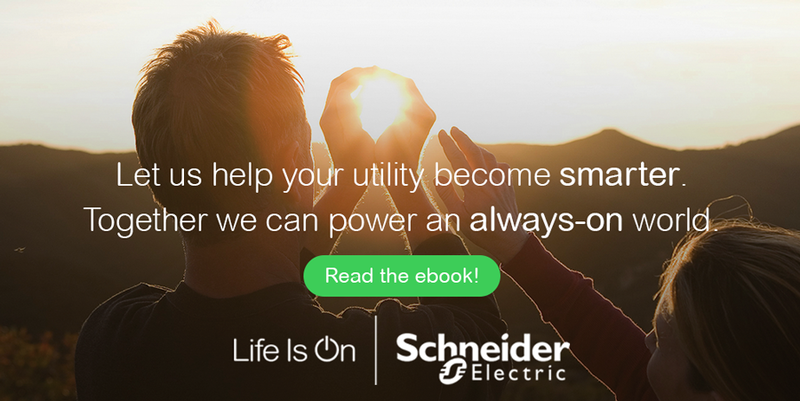 To learn more about the future of the utility industry, read our free ebook, Powering an Always-on World. And be sure to check back for future blogposts in this series.